Are the same separatists accused of shooting down Malaysia Airlines Flight 17 now looting, tampering with the evidence and stopping investigators from combing through the wreckage? Three days after the passenger plane plunged to the ground, criticism over the handling of the crash site in rebel-controlled eastern Ukraine showed no signs of slowing on Sunday. Key questions remain unanswered: What will happen to the remains of the 298 people aboard the plane that crashed Thursday? Where are the black boxes? And is there any hope investigators will be able to determine who’s responsible? Russian President Vladimir Putin fired back with a video statement posted on the Kremlin’s official website early Monday, arguing that his country has been pushing for peace in Ukraine. He stressed that safety must be guaranteed for international experts investigating the crash. “We must do everything to ensure their work has full and absolute security (and) ensure necessary humanitarian corridors are provided,” Putin said. At the crash site, there were concerns the bodies had been picked over by thieves. “The facts of looting, how the terrorists are dealing with the bodies, are beyond the moral boundaries,” Ukrainian President Petro Poroshenko tweeted. The local head of the rebels rejected accusations that his forces shot down the plane, denied accusations that they removed the bodies and denied responsibility when asked about people reportedly using stolen bank-issued cards taken from the victims’ bodies. “It is possible that some local residents could have searched the bodies of victims, found their cards and tried to use them. Unfortunately, I can’t exclude the possibility of this,” Alexander Borodai said Saturday. The situation at the crash site showed some small signs of improvement on Sunday, with more control and more activity. But it was still far from a well-organized investigation scene, and the area remained under the control of pro-Russia rebels. Government emergency workers prevented vehicles from driving up the road to the main crash site, but people could still roam the fields on foot. 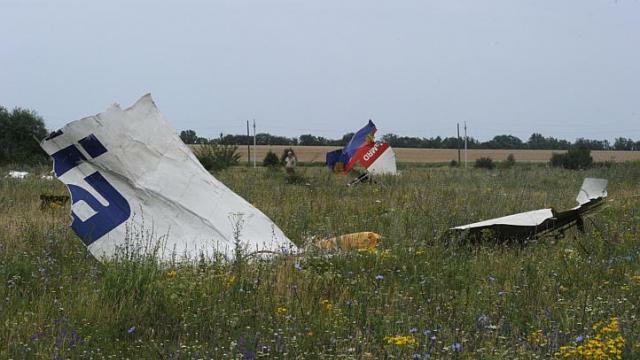 Search teams have found 251 bodies at the crash site, the Ukrainian Cabinet said on its website. Pro-Russian rebels are keeping the remains of nearly 200 MH17 victims in refrigerated train cars, Vice Prime Minister Volodymyr Groysman said Sunday, adding that talks were ongoing for their release. OSCE observers went to a train station about 15 kilometers (9 miles) from the main crash site to see the bodies, Bociurkiw said. Earlier Sunday, Russian state news agency RIA Novosti reported that the train was headed to Donetsk. Borodai told ABC News on Sunday that rebels want to release the remains. “We can and we want to give bodies to the relatives, but experts have to examine the bodies here. That is international practice,” Borodai told ABC. If the remains are turned over to the Ukrainian government, Borodai said he feared that they would be used as evidence to blame his fighters for shooting down the plane — an accusation he has repeatedly denied. Hundreds of staffers from the agency are searching for the remains of the MH17 victims, covering an area stretching across 13 square miles (34 square kilometers). Busloads of volunteers from nearby coal mines also fanned out across the wheat fields where the bodies and debris from the plane fell. Malaysia is sending two large military cargo planes to bring back the remains, the country’s official news agency Bernama reported. Pro-Russia rebels may have recovered the plane’s flight data and cockpit voice recorders, Borodai said on the website of the self-declared Donetsk People’s Republic. If experts determine the devices found are the so-called black boxes, they will be turned over to international investigators, Borodai said. “These are some technical objects. We cannot say for sure these are black boxes,” he said. Borodai said the devices are under guard in the region. They will not be given to Ukrainian officials, he said. Reuters distributed video on Sunday of what appeared to be an inflight recorder found by a worker in a field. The agency labeled the video, shot Friday, as showing one of the two flight data recorders from MH17. Bociurkiw said the OSCE had not confirmed whether the black boxes had been found. “We will declare the black boxes found or located when we actually see them,” he said. Some Malaysian investigators flew to Kiev, the Ukrainian capital, on Saturday. But Malaysia’s official news agency said they were still negotiating with rebels over access for their team. Law enforcement officials from the Netherlands, the United States and Australia will help with the investigation led by the Ukrainian government. Two FBI agents arrived in Kiev, a senior U.S. law enforcement official said. An investigator from the National Transportation Safety Board was also there. But three days after the deadly crash, it was unclear when an international investigation at the scene would be able to start. Journalist Noah Sneider, who’s been covering fighting in Ukraine for months and was one of the first to arrive at the crash site on Thursday, said confusion at the scene is no surprise. For the families of the victims, the uncertainty only deepened their suffering. Silene Fredriks said her son and his girlfriend had taken Flight MH17 for a planned vacation in Bali. At Amsterdam’s Schiphol Airport on Sunday, she laid flowers and signed the condolence book. She says she wants Russian President Vladimir Putin to ensure that the two young people’s remains make it back to the Netherlands. “I can do nothing but wait for their bodies,” she said. Governments from around the world have expressed outrage at the disorderly situation at the crash site and called on Putin to use his influence on the rebels. Cameron called Putin on Sunday to urge him to do what he can to ensure the victims “have proper funerals.” His opinion piece urged Putin to find a way to make the crash site more accessible and calm the strife between Ukraine and the rebels. “If President Putin does not change his approach to Ukraine, then Europe and the West must fundamentally change our approach to Russia,” Cameron wrote. Ten of the passengers on MH17, which was en route from Amsterdam to Kuala Lumpur, were British. Australian Prime Minister Tony Abbott, whose country had 27 citizens on the plane, added to the pressure on Putin. Russia has denied any involvement, and Putin said Ukraine’s military campaign against the rebels was to blame. He also has called for a “thorough and objective investigation” of the crash. Since the crash, the Ukrainian government and the rebels have traded bitter accusations over who was responsible and what has been done since. Ukrainian officials have said that a Russian-made Buk M1 missile system, brought into eastern Ukraine from Russia, had shot down the Malaysian airliner. The Ukrainian government has accused the rebels of removing debris and 38 bodies from the scene as part of an attempt to cover up what happened. Borodai has told reporters that the rebels lacked the firepower to hit an aircraft that high. The United States has said evidence suggests a Russian-made surface-to-air missile fired from the rebel territory took down jet. Kerry said a convoy of about 150 vehicles moved several weeks ago from Russia to eastern Ukraine. The military equipment included “multiple rocket launchers,” he said. “It’s pretty clear that this is a system that was transferred from Russia in the hands of separatists,” Kerry told CNN on Sunday. A written statement from the U.S. Embassy in Kiev also included mention of Russia providing training to separatists at a facility in southwest Russia. “This effort included training on air defense systems,” the statement said. U.S. officials believe the missile systems may have been moved back across the border into Russia.